Work by day, play by night. Shibata wanted more shelf space in her home office, so she added a plywood door with built-in bookshelves that opens into her bedroom to form a reading nook. Glimpsed from the adjacent room, the space looks larger than it actually is, thanks to the bright green walls. 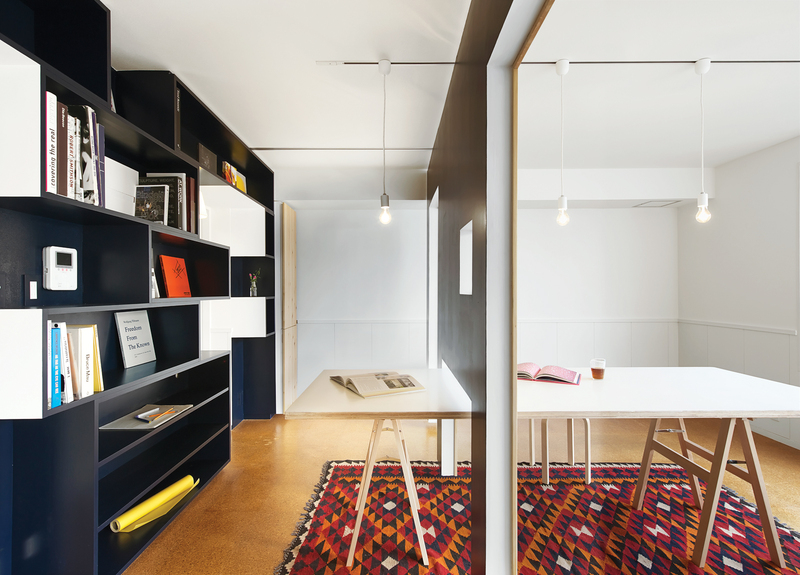 When Tokyo architect Yuko Shibata and her husband bought an aging 940-square-foot apartment in 2009, she knew she wanted to remodel it to include a home office where she could base her firm. But there was a catch: “My husband wanted to come back to a home, not an office, and I needed a switch of some sort when work was over,” she says. So how to meet the challenge while sticking to a tight budget? For inspiration, she turned to fusuma, the sliding paper screens that effortlessly divide or expand the rooms in traditional Japanese homes. Instead of cloistering her office in a corner, she made use of her entire house. She cut a hole in the wall between her bedroom and the workroom, then installed a huge door that swings open to reveal built-in bookshelves, expanding the workroom and partitioning the bedroom at the same time. To turn the dining room into a meeting room and library, she built a wall that slides on ceiling-mounted tracks, partitioning the room and adding intrigue to a formerly bland space. At night, the apartment swiftly morphs back into a residence. To keep costs down, she left the apartment’s original structure, plumbing, and wiring untouched. “Limiting the types of work done made it cheaper,” Shibata says. The result: a full-apartment remodel that cost less than she’d spend to rent an office for three years.